CalcuLASER: A FREE demo version is live! The demo is absolutely free and will allow unlimited access to the tutorial area, as well as areas 1, 15, and 35, in case you or anyone you know will be interested in getting a feel for it, first. Look for CalcuLASER FREE on the Google Play Store, or click the link below to grab it now! Beta Release Notes / Thank You Beta Testers! 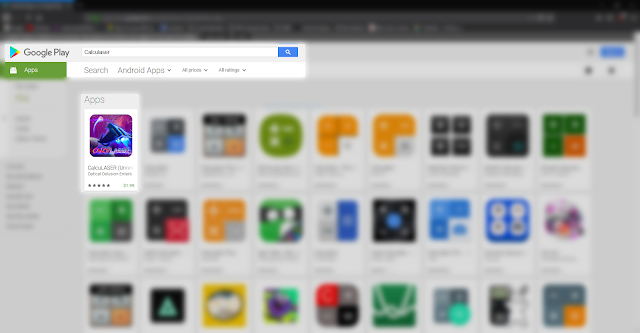 Thank you to all Beta testers! It is because of your helpful feedback that we are able to continue to make CalcuLASER better. Below are all of the changes we made since releasing to Beta until now, as we finalize final prep to go live. Modified tutorial visuals and steps for greater clarity. Fixed score count code for values less than 20. Fixed bug in score count that caused Area Clear hang up. Added bookmark buttons to the level select screen. Created tutorial system and tutorial button. Set up FreeVersion boolean in save file to turn on/off version specific features. Set up code to change necessary features via FreeVersion boolean. Enabled the selection of locked level buttons for description display & "Launch/Locked" button change. Added buffer zone to asteroids with separate x & y check parameters. Tested thoroughly to ensure no immediate sequential spawning of asteroids behind each other. Implemented random selection of one of 4 missile sounds. Added touch-response skip to Area Clear screen, skipping to end with final score value+bonus already applied. Repositioned background properly, now centered and perpendicular to camera. Made minor feedback modifications to level select screen. Changed default unlocked levels to 1, 15, and 35. Changed subtraction problem creation to new method and updated description code to match. Reduced max spawn Y limit for asteroids due to large numbers being off screen. Fixed completing high levels not unlocking everything below. Reduced asteroids per level by 5 (from 15 to 10 at level 1, etc). Modified Area Clear scene and fixed bugs. Fixed score count bug when over 1000. Fixed sounds not respecting Effects Volume. Made missed shot rotation random. Removed access of incompatible android versions. Unlocked levels 10, 20, and 30 by default. Made missed shots a little more visibly obvious. Fixed Performance Stars not being gained. Fixed sound effects ignoring volume level. Sale begins Friday, January 18th, 2019, and will go until Friday, January 25th, 2019. CalcuLASER public beta is now live! To play, download the game to your phone, locate the icon and run it. Select the available area (1 if you just installed for the first time) and press "Launch". Your ship should now be visible. Shortly, asteroids will start appearing; each will have a math problem associated with it. There is an auto lock-on mechanism which will show the problem; once visible, select the correct answer to blow up the asteroid. You may also manually switch between locked on asteroids. 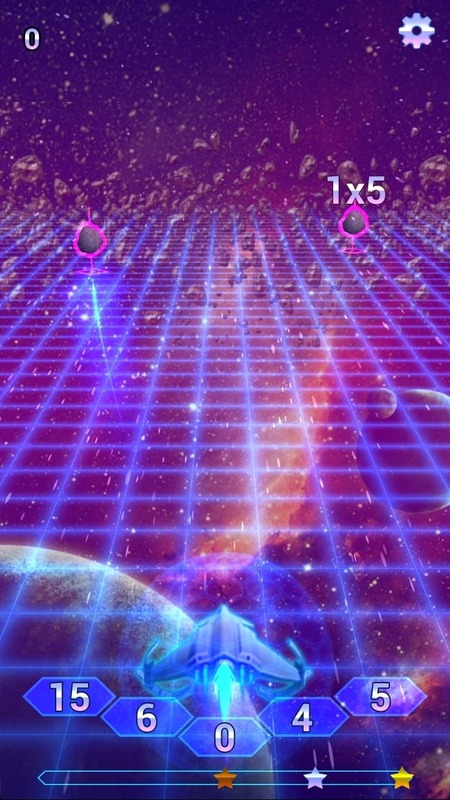 Get as high a score as possible in as few tries as possible; unlock a BRONZE STAR (50% of problems answered correctly on first try) to unlock the next area. Replaying levels grants an increasing replay bonus. This is an open beta release. The game may contain bugs or issues; if you encounter any, we would be most greatful if you could inform us of them in the comments below. 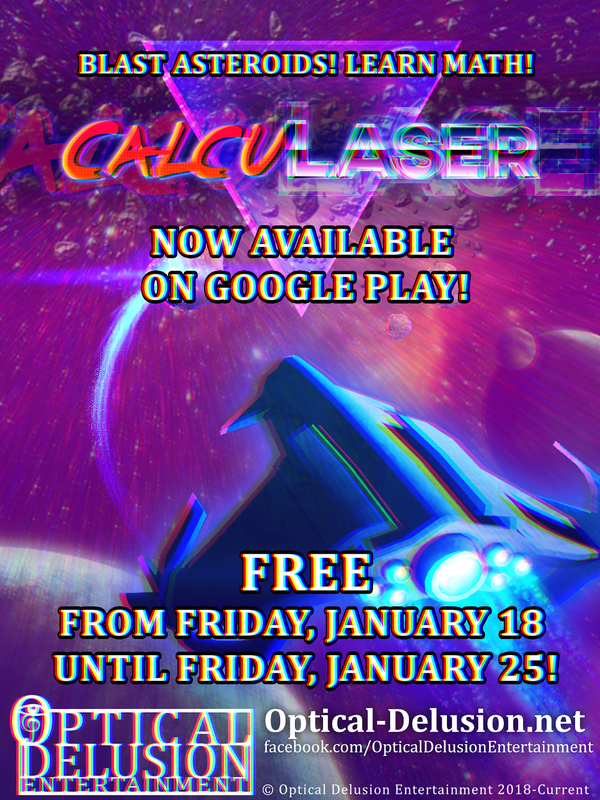 Thank you for downloading CalcuLASER, we hope you have a fun, educational time! Our programmer is best programmer. © Optical Delusion Entertainment. Simple theme. Powered by Blogger.